Know from the onset that this is a book you will need to read twice. That’s not a bad thing, though. Arcadia is so full of plot, so rich in its complexities, so perfectly executed, that I actually look forward to reading it again! Describing Arcadia is no easy task. It takes place simultaneously in the future, in the past, and in a seemingly parallel world akin to that of Middle-earth or Narnia (but without talking animals or humanoid creatures). It delves heavily into the nuances of time travel and alternate realities and provides viable explanations for the possibility of both. It is at times a work of science fiction, at times adventuresome, and times philosophical, at times social critique, at times pure fantasy, but it is always a well-written book that wastes not a single word in telling a deeply satisfying story. Be aware, though, that Pears expects much of his reader. Nothing even begins to make sense until about half way through. Every moment of this novel demands concentration and engagement. Everything, and everyone, plays a vital role to the tale. It is one of those rare novels that keeps the audience enthralled right up to the very last page. If you love multi-faceted, compelling stories that are delivered expertly, Arcadia is the book for you. 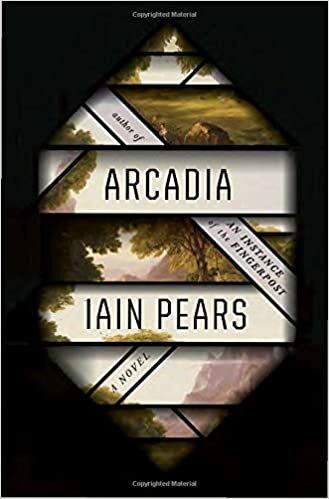 This entry was posted in Book Reviews and tagged arcadia, arts, books, entertainment, Fantasy, fiction, iain pears, literature, novels, read, review, science fiction.